First & foremost Hammerworks handcrafted reproduction English Tudor Copper Wall lantern & Post Lanterns employ a construction method of heavy solid copper. 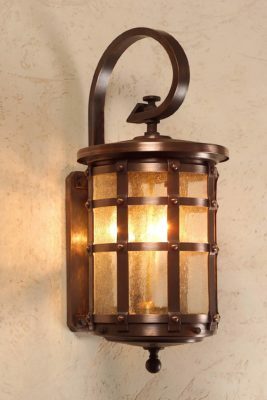 As a result they fulfill your design expectations with some of the most unique Tudor style post & wall lights available. Most importantly what sets these Old English Tudor lights apart is the combination of skills mastered by the craftsmen in our shop. They include riveting, which is the defining style, as well as hammer forging of the heavier metal pieces. In addition metal spinning the tops & bottoms, as well as the custom bent glass complete each piece. Our Olde English Tudor Chandeliers & Wall Sconces give you a look unparalleled in the lighting industry. First of all the strong but simple shape of the chandelier stands out in any setting. Yet the hand applied rivets and hammered copper surface provides detail and texture demanding a closer look. Furthermore the graceful half round shape of the coordinating sconces mirror the strong simple lines of the chandeliers. In addition the Arrowhead Sconce offers a look that is uniquely “American”. 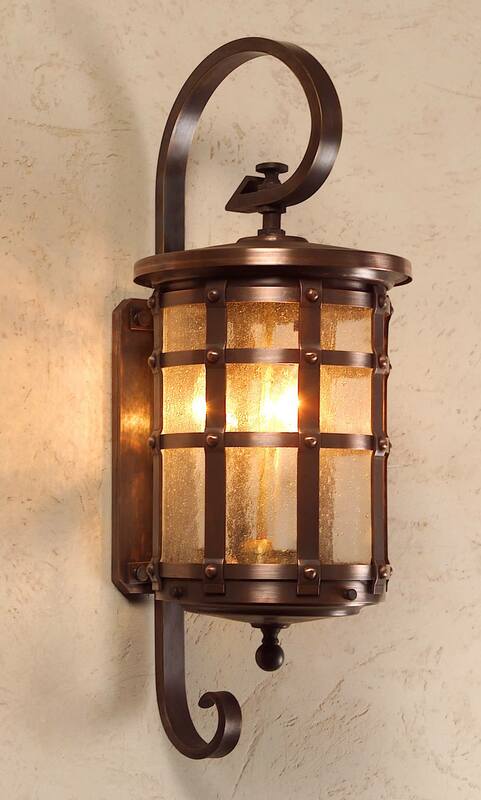 Of course this sconce is fully handcrafted from heavy gauge copper creating a look exclusive to Hammerworks. The design adds special charm & character to any room. Finally it is especially suited to log homes, lodges and other rustic settings. Hammerworks is proud to offer a unique handcrafted Olde English Tudor Lighting Collection. Our collection includes Post, Wall, Hanging, and Ceiling Mounted as well as Chandeliers and Wall Sconces. While these Old World light fixtures echo the look and feel of historic times, they make a bold architectural statement in a wide range of settings. Thus commercial buildings, lobbies, hallways and foyers as well as large kitchens and dining rooms are enhanced by the size, simple shape and character of these fixtures. 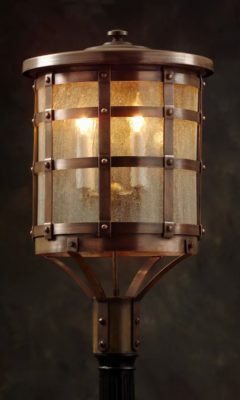 Finally the hand hammered heavy copper construction of these extraordinary lights will impress the most discriminating buyer.